The Salmon River Canyon may just be the Mount Everest of Oregon Kayaking. Huge, marginally portageable waterfalls combined with crumbly, near-vertical canyon walls and questionable rescue possibilities make this a very serious venture indeed. We had been looking at this one for awhile, with Pete doing the lions share of the work. Finally Tim Gross and Joel Bandstra went in and completed the first descent. I was very excited to hear about their descent, and though they didn't run the upper half of the canyon they did run the bottom (hardest) part, which contains two monstrous waterfalls. I ran into one of the first descentionists afterwards on the Little White and he said that the Salmon was 'The most committing run I have ever done' which is saying a lot given his paddling resume! The view from the Canyon Rim. Here's a rather amusing series of email excerpts leading up to our eventual 'discovery' of this fantastic place. When we first saw the canyon we were tripping all over ourselves to do this run, planning the logistics, etc, etc.. I didn't see anything I would consider a waterfall although the gorge section I scouted did have a big drop, not a clean vertical drop though. I have a feeling the canyon is not sheer-walled although that is just a guess based on what I saw of the lower canyon. I'm not saying that I would take this river lightly, just that I'm optimistic that everything will be runnable or portagable. I have been known to be wrong, however. I have scouted the Salmon River Canyon a bit and found most of the falls, (which are not apparent from the trail through the valley). They are incredibly beautiful and potentially runnable though at least one is a bit big to sanely consider (50-70 feet). There are some I did not see. I would love to do this run for the exploration of it. the whitewater would come, I think, almost purely in the form of waterfalls spaced out but there are many. I have always wanted to run this one but it is a small nightmare logistically (big shuttle) and hard to get people to do. It would be important to do it at the right level as the waterfalls looked like some would get appreciably harder with increasing water (read: dangerous). Portaging around the big one, as I can remember it, may require some amount of rappelling and/or steep scrambles. All easy to stop for and scout though. The put in, that I have in mind, may be hard to access due to snow. I did some research on the Salmon. There's an old USGS gauge at Linney Creek; historically it seems to peak around mid-May (sometimes earlier). One example (1950) had it at 900+ cfs, with it slowly falling the following weeks but remaining above 400 cfs til the end of June. Sandy river, marmot gauge, was reading 2800 at the same time as the 900cfs reading at Linney. I also did some corresponding with Jeff Bennett. He knows of no one who's run it, but he did say that 10 yrs ago it was considered to have unrunnable and unportageable falls in the crux gorge. Of course people's risk-acceptance levels have changed a lot in 10 years, but folks were running what's still considered hard class V to V+ stuff (like the Little White, Ernie's, Carbon, etc.) back then. So we scouted, we talked, and we went to California to paddle the Smiths. We explored and completed other first descents, but we never got around to the Salmon. Somebody else did, though... They went in there at low flows, (which is when the photos were taken in this report) and they DID IT. They put in halfway down and ran all of the falls except Final Falls, which they rappelled around. Like I said at the beginning they described it as requiring an 'incredibly high level of commitment'. 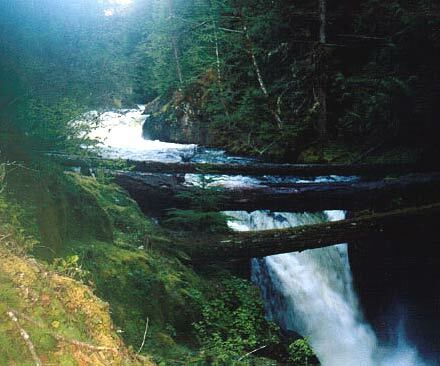 Here's the photos of the waterfalls in the Salmon. Final Falls, the last waterfall in the canyon. This was the only falls not run on the First Descent. They rappelled on the left side, I believe. I'm sure they ran the 20 footer just upstream, which doesn't have a name that I know of. The view from the top of Final Falls. Frustration Falls from the front, which is just upstream of Final Falls. 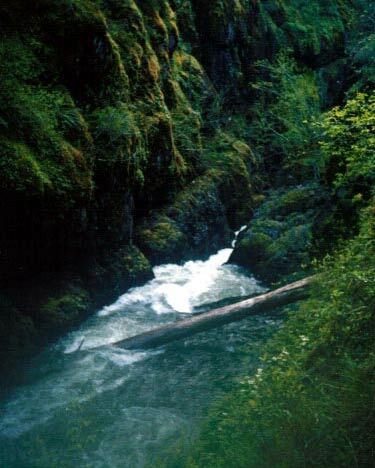 This three-tiered waterfall was run down the river right side on the first descent. 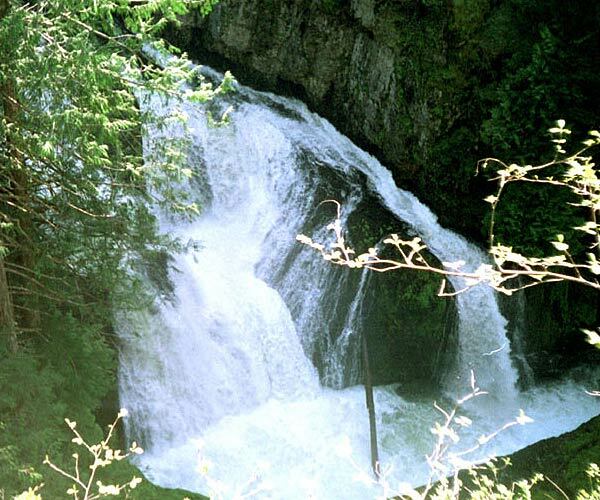 The middle falls has a Big hole that the first descentionists said required a cool nerve and a perfect line as a thrashing would result in a swim over the 30 footer just downstream. The bottom drop on Frustration, which is about 30 feet. This shot shows the left side of the drop. Higher up in the canyon, this is Vanishing Falls. Just upstream is Little Niagara Falls. I have heard that there are two more thirty foot falls upstream of Little Niagara (Stein Falls and Split Falls). One is runnable, and the other is marginal. Both are portageable according to the person ( the optimistic first descentionist mentioned above ) who found them on their second scouting mission into the canyon. 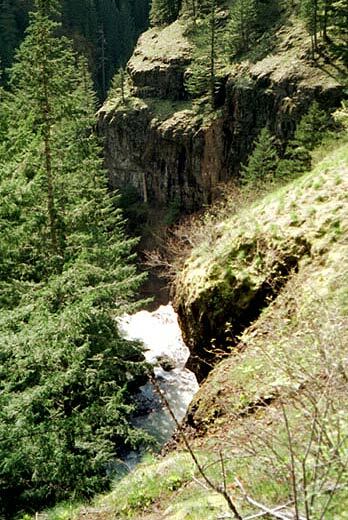 The narrow drop in the gorge just below Vanishing Falls. Well I hiked up to several of the falls on the Salmon river and thought I would give everyone my impressions. First off, I won't be hiking up there again because it is a long hike with a lot of uphill in it. Scouting the falls from the trail involves a lot of hiking up and down some steep slopes with lousy rock. By the time I was done, my quads felt like I'd just done battle with a stairmaster. Anyway, my impressions. Starting from upriver, Little Niagara Falls looks to be about 10 ft, riverwide, with a pretty good hydraulic at the bottom. Good pool above and below. Probably runnable wherever. 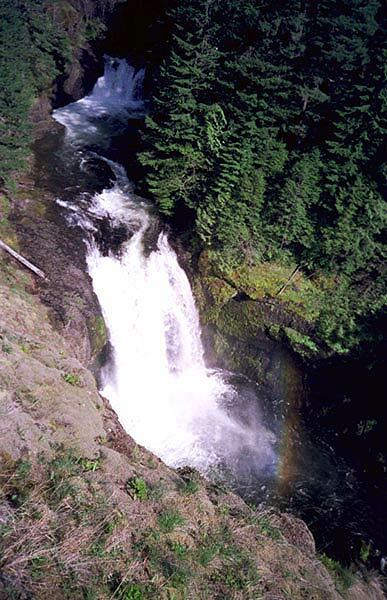 Immediately below is Vanishing Falls, which drops about 15 ft. as it funnels into a narrow gorge. This falls is kinda of foldy which would make the hydraulic at the bottom a little difficult. Looked to have undercut rock or recirculating hydraulic on the left. Decent boof down the middle going right or right going right. The wood is higher off the water than it looks in the photo. Below Vanishing the river enters a narrow gorge which continues almost all the way to Frustration Falls (reminds me of the upper Farmlands). At the beginning of this gorge is a nasty looking 4-6 ft. drop which looks to push into the left wall (undercut??). could probably boof right at low water. 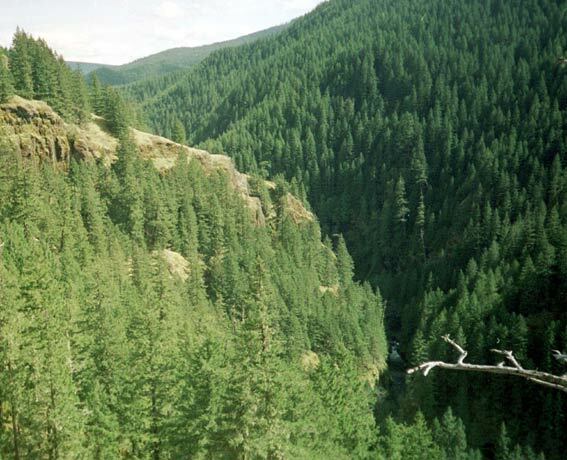 There is at least one log in this narrow gorge which could be limboed on the right. Any other wood in this section would be difficult to avoid although there are some small eddies, the options for exit are few. Frustration Falls begins with a 15 ft. drop on the left. The right side goes into a sieve. Decent landing below the drop although there is a healthy amount of wood and there could be more below the surface. Swimming would not be a good option here. After a small drop below the first falls, the flow splits. The right side drops about 10 ft. and looks pretty clean although too far right drops you into a diagonal hole. About 10 yards downstream the river drops at least 30 ft. down into the pool below. Several clean lines down this if the pool at the bottom is deep enough. Despite my earlier comment, the left side line is not an option as it throws you into the opposite wall at the bottom. About 30 yards downstream is a 20 ft. river-wide drop with good boofs on the left and middle and a not-quite vertical line on the right into a powerfull hydraulic. Small pool (20 yards) below this before the entrance to Final Falls. Final falls is big! I'd say at least 40 ft., mostly vertical. The entrance has some difficult currents which would screw with your line and reduce your speed. I thought the left side had a decent boof and you miss the main flow of water going over the falls. Despite how nasty the above description sounds everything is scoutable from the right bank at river level. There is a good bench on at the top of Frustration Falls which allows for an easy scout of the whole thing. The drop below Frustration Falls is also scoutable from the right, and you can stand at the lip of Final Falls on the wide rock platform on the right. Vanishing Falls is an easy portage on river right as is the nasty little drop in the gorge below it. Portaging the little drop would require a seal launch back into the gorge or a hike downriver to some other access point. Frustration Falls can be portaged on the bench on river-right. The last part of the portage involves some scrambling down some wet, rocks. A rope to lower the boat and a partner would make this pretty easy. An 6-8 ft. seal launch is required to get into the pool below Frustration Falls. The drop below Frustration can portaged on the right. Final Falls is the difficult one. The left side is a 30 ft. sheer cliff. 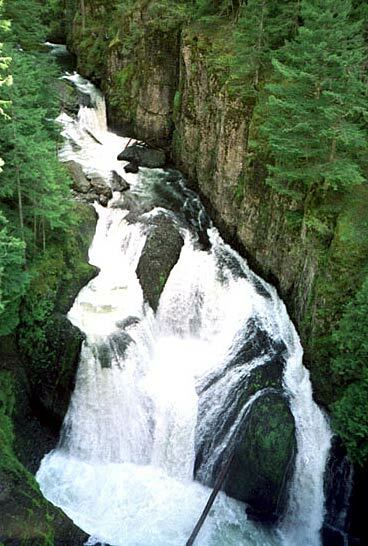 The right side would require a 30 ft. rappel to the base of the falls or a 20 ft. climb down a near vertical rock face a little farther downstream. Both options are doable but if heights make you nervous these options would be terrifying. There are two more waterfalls in the canyon in the 30 foot range, one of which is runnable and the other would only be considered by extremists. The rock in the gorge is pretty bad for climbing. Very crumbly and unstable. In a couple places slipping would be a very bad thing. some of the scrambling made me pretty nervous although a little rope support and a couple people would make it much better. I think 700 cfs would be a fine level but 400 cfs might be better. I didn't really see any bad hydraulics. Some lines might disappear at lower water but the risk of getting stuffed into a log or undercut might make lower water worth it. In case you are wondering, I walked essentially what would be the portage lines for everything except Final Falls so I know the portages would work. I looked at all the drops from river level and that's what I based my judgement of runnability on. For what it is worth, I would run everything except Final Falls, given the right conditions. I'd put everything at Class 5 except Final Falls which I'd give a 5+. I think Final Falls is runnable but I've sworn off big vertical falls like that. The pics aren't the greatest but they couldn't begin to convey just how cool this whole area is, anyway. It is unbelievable at river level! I've attached pictures of the bottom of Frustration, Vanishing Falls, and the nasty drop at the beginning of the gorge below Vanishing.